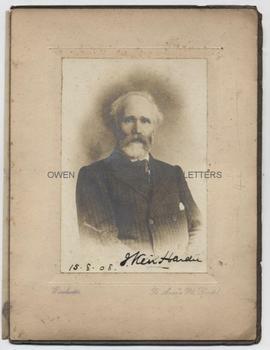 JAMES KEIR HARDIE Signed Photograph. British (Scottish) Labour politician. The first Labour M.P., first leader of the parliamentary Labour Party and founder of the I.L.P. 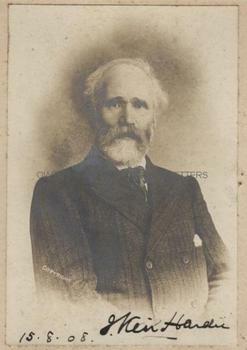 Signed photograph of Keir Hardie dated, in Hardie's hand, 15th August 1908. With a good, bold autograph signature in ink across the foot of the photograph. Hardie is shown half-length in vignette, facing the camera with serious but benign gaze and wearing a double-breasted woollen suit. The photographer is W.A. Winchester of St Anne's Park, Bristol. The photograph measures 6 x 4 inches (excluding photographer's mount and approx 9 x 7 inches including mount). It is mounted on photographers board with the photographer's printed name and address at foot and contained in a the original folding sugar-paper cover with tissue guard. A few slight foxing spots, else very good. The photographer, Winchester of Bristol, took several photographs of both Keir Hardie and his wife, Lillie Hardie and from correspondence between the two it is assumed that Winchester was a member or supporter of the Independent Labour Party, of which Keir Hardie was the principal founder. This photograph was later reproduced in the souvenir programme that was issued September 1911 when the Hardies opened the Kingsley Hall, the headquarters of the Socialist movement in Bristol. Keir Hardie was undoubtedly one of the most important figures in the development of Socialist POLITICS in Britain. 1908 was a momentous year in his life, as it was in this year that Keir Hardie resigned as Chairman of the British Labour Party, to be succeeded by Arthur Henderson. He spent the remainder of his life campaigning for trades unionism, pacifist causes and votes for women (he was a close friend of Sylvia Pankhurst). Despite his radical political views, James Keir Hardie was a quiet, unassuming man and his autograph is uncommon. 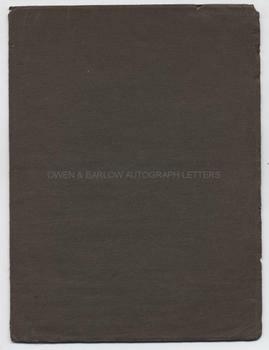 Photographs signed by him, are particularly rare.